If self-deception is an art form, than I must be Michelangelo; the delusion that the few idyllic moments I spent with Maddie this morning could be anything more substantial than a brief respite from the turmoil that is my life, was a masterwork. I said demons would come, and they did come; but whether one at at time as I predicted, I cannot be sure. The chaos I found upon reaching Sterns-Carson would make it seem that an army of them had descended upon this hospital sometime during the night. The distant sound of wailing and crying and raucous laughter from deep in the hospital’s wards, greeted me as I stepped through the front door. On only one other occasion had I ever heard such a ruckus raised at Sterns-Carson; during a violent thunderstorm when a bolt of lightning struck the rod attached to the center chimney and shook the building to it’s foundations. The resulting wailing and gnashing of teeth among the hospital’s inmates that day, epitomized my expectations of Armageddon. I strode to my office intending to quickly deposit my coat, and then proceed into the hospital wards and discover what the problem could be; just as I laid my hand on the doorknob, Nurse Wallace called to me from up the hall. While she hurried toward me, I opened the door and proceeded into my office rather than waste time with acknowledgment and ceremony; I deduced that in all likelihood, she did not bear good tidings, so I might as well not delay in divesting myself of any encumbrances. She burst into the room just as my coat met the tree. Doctor Agnostica, she said, trying to catch her breath, it’s horrible, so horrible. It certainly sounds horrible enough in this hospital, I replied; Now please compose yourself and tell me what the devil is going on. Zeke is missing again, and Claude Fortrel has hung himself in the dayroom, and they can’t find Mr. Evans, the night watchman. As I attempted to categorize this catastrophic onslaught of events, Nurse Wallace wrung her hands and glanced repeatedly over her shoulder to the hallway; I asked her the whereabouts of Mr. Jenkins, knowing that he would be more composed and able to provide a more detailed explanation. Mr. Jenkins is at the hospital’s rear entrance, she said, where Mr. Evans kept watch. He and Mr. Kleiner are looking for Mr. Evans. There’s blood on the floor back there. Blast it, I said; is anyone else missing or injured? Mrs. Wallace gave me a blank look and merely said, I don’t know. I headed up the hallway fully expecting Nurse Wallace to follow, but when I glanced over my shoulder, I saw her just standing there in the doorway of my office, staring at her feet; I hoped that I would not find the rest of my staff incapacitated in like manner. The tumult I’d heard at the front of the hospital swelled to a cacophony as I came closer to the dormitories; Sterns-Carson appeared to have been transformed into the epitome of bedlam. 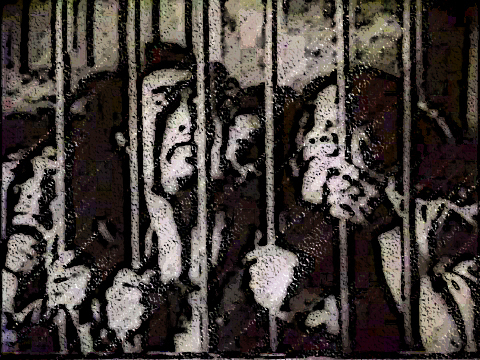 Knowing many of the inmates penchant for extreme behavior, I imagined the worst; deluded souls possessed by terror, some doing violence to themselves, and some relishing the thought of visiting violence on others if the opportunity presented itself. A few orderlies had broken out cudgels; I witnessed them being used with force at several locations. It tugged at my heart strings to see it, but a riot in an asylum can be just as dangerous as one in a penal institution; maybe more so, due to the general lack of cognizance of consequences among the mentally impaired. I finally made it across the center of the hospital building and into the long hallway that leads to the rear entrance. Off in that distance, a knot of hospital employees clogged the hall and made it impossible to see beyond them. I reached the group and pushed my way through just as Jenkins and Kleiner stepped in from the foyer. Jenkins, what the deuce is going on here? I asked. We’re looking for Evans, Doctor Agnostica; He’s gone missing. At this point, I noticed a large stain on the wooden floor in front of the chair and small desk that comprise the night watchman’s station; I glanced at the hospital employees ringed around; They all looked back at me like children who are puzzled by a mathematical equation, hoping that I’m the teacher who can explain it to them. Why are you all just standing around? I said, in a stern voice; All hell is breaking loose in this hospital; I suggest that any of you who would like to keep your jobs, had better hurry off and see what you might be able to do to put things back in order. They stared at me for another moment, then began a slow exodus. As the crowd dispersed, I felt a pair of eyes still on me; I looked to my left and met the gaze of Molly the young cook. She stood obscured in the shadow of a nearby doorway, her hands twisted up in her apron as she stimulated herself through her clothing like a spasmodic nymphomaniac. Her dark brown eyes drew me inward; and just like my encounter with Zeke in the examination room, I knew her mind; she was aware of my previous lust for her, and wanted nothing more than to let me have my way; preferably right here, right now; the two of us copulating in that smear of blood that lay on the floor at our feet. It was a vile image of moral degradation; my soul has never known such a darkness as at that moment. I told one of the nurses to remove the girl from the area immediately, and treat her for shock; I wished I had my laudanum bottle in hand. I turned back to Jenkins and asked once again for an explanation regarding our disappeared sentinel. Evans was on watch last night, Jenkins said, when he didn’t show up at breakfast, I came looking for him; He’s fallen asleep on duty more than once and I had planned to give him his walking papers if that was the case again. Jenkins gazed at the stain for a moment, as if to gather himself. There’s a blood trail through the foyer, he continued, goes down the steps to outside, then nothing. A group of onlookers remained clustered nearby, eavesdropping while they shuffled their feet in feigned movement. I glared at them and said, Mr. Kleiner, see that these people return to work, immediately. If any of them fails to do so, I empower you to forcefully eject them from this hospital. Yes, Dr. Agnostica, Kleiner said; Alright, you heard it. Back to work, all of you. As Kleiner herded the stragglers up the hall, I turned back to Mr. Jenkins. Mrs. Wallace tells me that Claude Fortrel hung himself last night. Yes, Jenkins replied, I was just told of that a few minutes ago. She also said that Zeke has vanished again, I said. Jenkins paused, as if that were the most disturbing news so far; I hadn’t heard that, Sir, he said. I moved closer to Jenkins and said, Show me the rest of this. He led me through the foyer and out the back door, into the still gelid morning. The sun had failed in a feeble attempt to broach the cloudy grey sky; the landscape in the bare trees beyond the lawn, looked absolutely forbidding, like some frosty place of death. There is a thin blood trail down the steps, Jenkins said, the kind that usually indicates a wound that is not immediately fatal. At the bottom of the steps, it vanishes. So, Evans had been wounded somehow and walked down the steps into the yard? Normally, I would think so, Sir, yes, Jenkins said. But there are no footprints to indicate that. 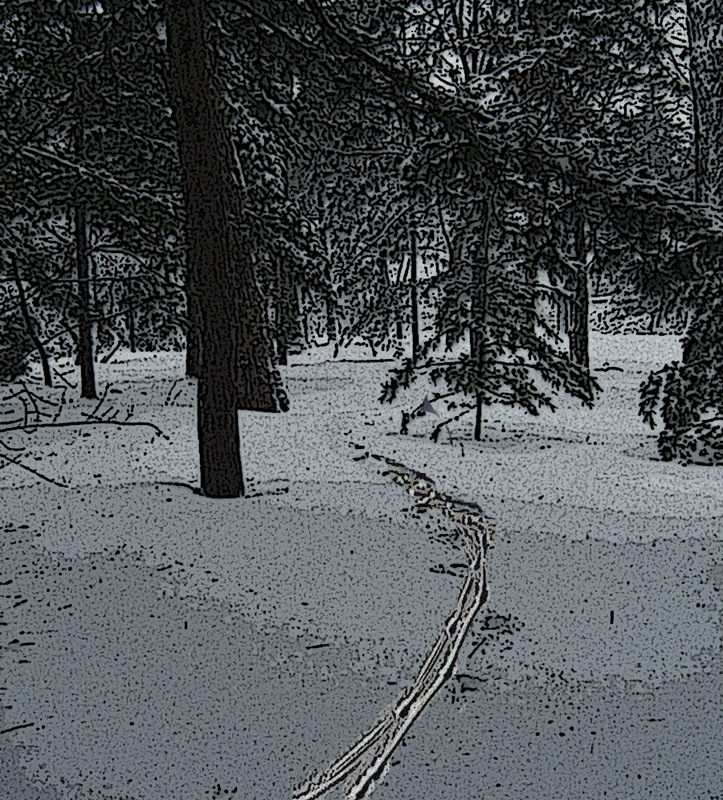 I pointed to a path in the crusty snow. There are tracks down there, Mr. Jenkins, I said, they must have been made by Evans. Those are hoof prints, Doctor, he replied; Just like the ones I found that other time; A single deer; There are no human footprints in that snow that were made more recently than the day before yesterday. I stood and looked out over the sanitarium’s back yard, searching for any sign that would lead us to Evans; I knew in my heart, that I would never see him again. I’m not sure why, but I then asked Jenkins if Mrs. Scott was accounted for. As far as I know, he said, I haven’t heard any differently; Should I call the police now, Doctor? The police; in all the hubbub, that thought had not even crossed my mind. If the police were to get involved, that could mean that the whereabouts of Mrs. Sinclair would become general knowledge in short order; a development that would not be beneficial to myself or to the hospital. If I called Mr. Connor, that might even be worse. I decided right then to keep this affair in house. We’ll not call the authorities, Mr. Jenkins, I said; we have patients here whose anonymity is of the utmost importance; Was Mr. Evans married? No sir, Jenkins said; He lived alone in a rented room above the hardware store downtown; He’s from Indiana, I believe. Then he won’t be missed for awhile, I replied; Spread the word, unless they want to forfeit their jobs, all employees now on the premises must remain here until we are able to sort this matter out; Do you have any extra firearms? Yes, Jenkins said, a couple of hunting rifles and two shotguns. Good, I said, outfit the most reliable men on our staff and post them at all entrances; Have someone watch the front gate; They don’t need to stand out in the cold to do it, but they need to be able to see what’s coming up the road and the driveway. The top floor is the place for that, Jenkins said, there’s a clear view of the road in winter. Put your best man up there, I said. That would be Kleiner, sir, he replied. And get the maids up here to scrub the blood up off the floor, I added; I’m going back through the wards and make sure order is restored as quickly as possible. Very good, Doctor, Jenkins said, I’ll see to it all. We walked up the steps, back into the hospital, and discovered a small knot of employees still loitering in the hallway; I glared at them and they hastened away. I spent the next several hours in the infirmary, tending to those with wounds and injuries; my apprehension about violent incidents among the patients was well founded; in addition to the intramural activity, an orderly had been attacked by a group of inmates and suffered a fractured arm during his resultant fall to the floor. Only one fatality had occurred, and it was as bizarre as it was tragic; a geriatric female patient was discovered weeping and wailing, kneeling over a younger woman who had been her constant companion for the past 18 months. It appears that the old woman had attacked her friend, much as a vicious dog would a smaller animal, seized her by the throat with her teeth, and tore away until the younger woman had ultimately bled out onto the floor. The older woman proved inconsolable and it was a difficult matter to separate her from her dead companion. When they brought her to the infirmary, she came to me and gripped my arm like a vise with her frail hands. As she looked into my eyes with a fearful, yet malevolent stare, a compulsion to go to Mrs. Sinclair overcame me. I called for a nurse and orderly to take the woman away and sedate her heavily. I then divested myself of my hospital apron and hurried off to the isolate ward. An eerie quiet enveloped the isolate wing; it seemed untouched by the chaos that had run rampant through the rest of the hospital. My footsteps on the hard linoleum floor rang out ahead of me. A figure sat on a chair halfway up the hall, near Mrs. Sinclair’s door; I suspected it to be Hargest. When I got close enough to confirm his identity, he gazed up at me with a contemptuous look, and said; I trust things have gotten under control, Dr. Agnostica; It sounded very nasty from in here. Why didn’t you come help? I asked. With a sardonic grin, Hargest said, I thought it best to keep my station. I found myself with no reply; Hargest had done the right thing, though I knew his motives had nothing to do with what would be most beneficial for Sterns-Carson. Hargest rose and said, You’re here to check on Mrs. Scott; Help yourself, Doctor. I kept a wary eye on him and slid the speakeasy door open. Mrs. Sinclair stood with her back to me, gazing out the high windows of the small room, as I had seen her do on countless occasions, seemingly removed from her circumstances and the goings-on around her. I did not speak, for fear of engaging her; my intuition told me to let sleeping dogs lie. I closed the door and looked at Hargest. I’ll be right here, Doctor, he said, if you need me. I held my tongue with this boorish lout once again, turned heel and left the ward. I hurried back to my office, closed and locked the door, went to my cabinet and filled a snifter with brandy. I drank it straightaway, slumped down into a Morris chair, and fell into sleep. I was roused a short time later by a persistent knocking at the office door. Through my groggy state of mind, a cold fear slithered up my spine; I pictured Molly standing on the other side of that portal, writhing inside her starched uniform like a hungry snake anxious to shed it’s skin, ready to unsheathe her fangs and devour my soul. Who is it, I called out. Jenkins, sir, the reply came; I need to speak with you. I cleared the unholy cobwebs from my mind, got up, and stumbled to the door. Jenkins stood in the hallway holding a rifle. I hope it’s not more bad news, I said. You’d better come with me, Doctor, he said, I need to show you. I put my suit coat back on and joined Jenkins in the hall. Where are we going, I asked. The fourth floor, he said. We proceeded to the central elevator and went to the 3rd Floor. Then we climbed a narrow staircase up one long flight until we spilled out onto the vast expanse of the 4th Floor, which is really the full-length attic of Sterns-Carson. A small portion of the space is used for permanent files storage, but the difficult access makes it impractical for anything else. There are 3 dormers on each side of the length of the slanted roof; the front ones look out toward the road that runs along the face of Sterns-Carson, then to the expanse of farmland beyond; the rear ones open onto the woods that run to the horizon behind the hospital. Kleiner stood just beyond the middle front dormer, poised with his rifle; he alternately glanced at Jenkins and I as we approached, and then into the darkness of the rafters high above him. When we reached Kleiner, Jenkins said, We’ve found another missing patient. Then he shone his flashlight up into the dark recesses of the ceiling. 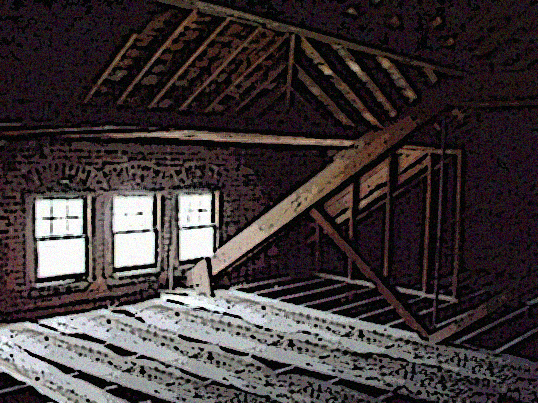 I peered upward into the illumination; after a few moments, my eyes adjusted to the harshly lit contours of the framework of the roof; but for the face looking back at me, eyes wide open, and mouth agape in terror, I would have thought someone had stuffed a bundle of laundry into the crevice between a strut and a rafter. That’s him, Jenkins said; I wanted you to see, before we pulled him down from there. You’ll need a ladder to do that, I said. Yes, sir, we will, Jenkins replied; How he got himself up there, I’ve no idea. From the looks of it, Mr. Jenkins, I said, someone put him there. Kleiner made the sign of the Cross. Get whatever help and tools you need and get him down, I said, then bring his body to the infirmary so I can have a look at it. Beg your pardon, Doctor, Jenkins said with a subdued tone, but I’ve got to ask if those are your orders, because I would call the police otherwise. Those are my orders, Mr. Jenkins; I told you that we will not call the police; The fact that Bobby Foster finally aggravated another patient enough to have this type of mayhem visited upon him, does not change my decision. At that moment, I felt like the Captain of some great Ship of Madness, where the only rule of law is my word; If things go badly from here on out, I will be the one to pay the piper. I have returned to my office, to gather my wits and steel myself for the night ahead; I have ordered a large carafe of black coffee and sandwiches from the kitchen; after I eat, I will return to the infirmary and examine Bobby Foster and tend to any other patients still in need. I have instructed Mr. Jenkins to double his guard and make sure that the men assigned are fed and refreshed before they settle in at their posts for the night; no breach in vigilance must occur. Though I sense that the storm has passed, I pray we have no repeat of whatever occurred here last night, but if that happens, we will be ready.